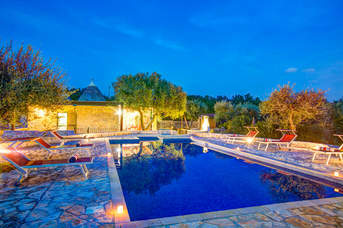 Our villas are set in the countryside with great views and within a short drive to the town of Alberobello. By day Alberobello is busy with visitors and when they depart in the evenings, the local way of life carries on with friends meeting up in the many cafes and bars, both in the trulli zone and main part of the town.Our villas are set in the countryside with great views and within a short drive to the town of Alberobello. By day Alberobello is busy with visitors and when they depart in the evenings, the local way of life carries on with friends meeting up in the many cafes and bars, both in the trulli zone and main part of the town. Throughout the town, you’ll find a wide range of places to eat from simple sandwich shops and gelaterias to high end restaurants. The majority specialise in Italian cuisine from pizzas to fine dining which may offer versions of Pugliese specialities. There a couple of wine bars where you can try the regionally produced wines. In the surrounding countryside, there are plenty of masserie, farmhouses which serves meals largely prepared with homegrown ingredients which are in season. The nearest beaches can be found in and around the town of Savelletri, about a 30-minute drive down to the coast. They vary from very simple coves with limited or no facilities, to smart beach clubs where you can hire a sunbed and have lunch for a whole day of relaxation. You could combine a visit to the charming resort towns of Polignano a Mare and Monopoli with some time on the beaches in and around them. There is a popular theme park, Fasanolandia, located between Alberobello and the coast, near the town of Fasano. You can visit its zoo and try of the theme park rides. Closer to Alberobello is a smaller water park, Acqua Park Alberobello, which is more suited to younger children. 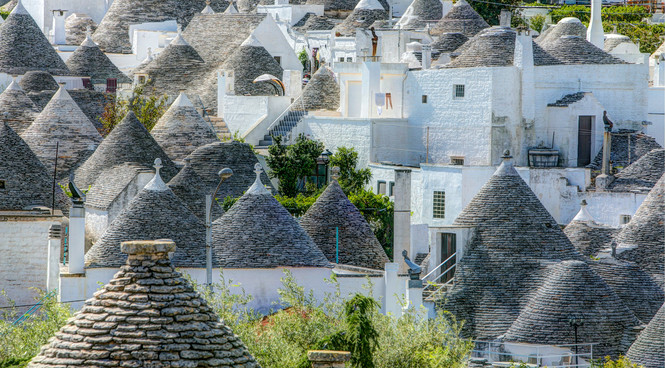 In Alberobello, the whole family can take a tour of the town and surrounding area by electric bike, Segway or golf buggy, while visits to cheese makers or picnic options are available too. You can venture underground to one of the regions many grottoes, the closest of which are at Castellana and Putignano. With a car, it’s easy to visit all the towns of the Itria Valley with Locorotondo being the closest. It’s also well worth driving to see the coastal towns of Polignano a Mare and Monopoli. For a full day excursion, the Baroque city of Lecce is around 1 1/2 hours’ drive to the south. Matera, a city renowned for its cave homes and churches is approximately 1 hours’ drive west. There are plenty of traditional farmhouses or masserie, many of which can be visited to buy wine and olive oil or even have a meal.